Abu Dhabi: New Zealand defeated Pakistan by 47 runs in the first match of the three-match one day series here at Zayed Cricket Stadium on Wednesday.Chasing a total of 267 runs, Pakistan bowled out for 219 runs in 47.2 overs. 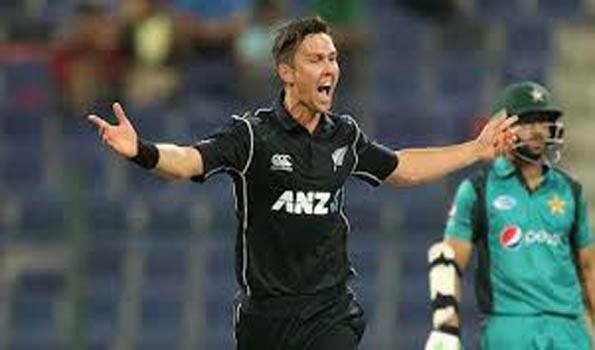 Trent Boult has become the third New Zealand player to get a hat-trick in ODI. Earlier in day, New Zealand won the toss and elected to bat first. With the help of Ross Taylor's 80 and Tom Latham's 68 runs, the Black Caps posted a challenging total of 266/9 runs on the board in their stipulated 50-overs.Shaheen Afridi and Shadab Khan bagged four wickets each. In reply, Pakistan got off to a poor start as Boult ripped through a powerful trio of Fakhar Zaman, Babar Azam and Mohammad Hafeez in his second over, reducing Pakistan to 8/3 in 2.4 overs.Except captain Sarfaraz Ahmed (64) and Imad Wasim (50), the duo added 103 runs for the seventh wicket to keep Pakistan in chase, no one could show any resistance and folded for 219 runs, giving New Zealand its first victory of this tour. Boult finished with figures of 3-54 runs in 10 overs, while Lockie Ferguson also chipped in with the ball and he also bagged three wickets in 9.2 overs considering just 36 runs.